This training nebosh has been developed for multinational organisations in all sectors working in accordance with international standards or directives but adapting to local needs. The Training NEBOSH provides organisations with a global presence seeking to adopt an internationally recognised health and safety training programme for its staff. The Certificate is an internationally recognised qualification and provides an excellent underpinning knowledge of safety & health and a sound basis for evaluating hazards and risks. The syllabus incorporates International, technical and other standards where they exist. In other cases, requirements and practices that represent ‘good practice’ are followed. The completion of a health & safety assessment of a workplace and a report to management will be carried out at the candidate’s workplace within 14 days of course completion. 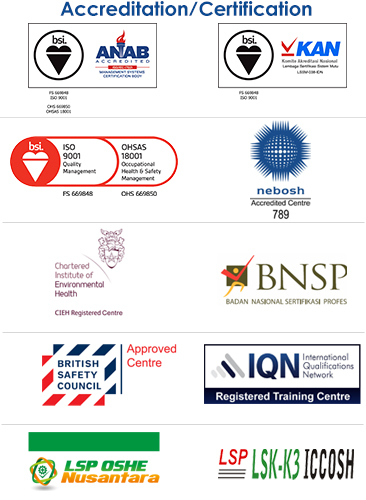 The NEBOSH International General Certificate (IGC) follows the same principles as the National General Certificate (UK) – achieving high standards of health and safety – regardless of any local legal requirements. Examinations are held on the last day of the course or for e-learners/distance learners four times per year at any British Council or participating university/Centre each year. In today’s working environment ‘Safety’ plays a key role in the success of any company. The NEBOSH International General Certificate provides a means to improve the safety awareness of company employees, particularly those involved with operations or directly related to safety. 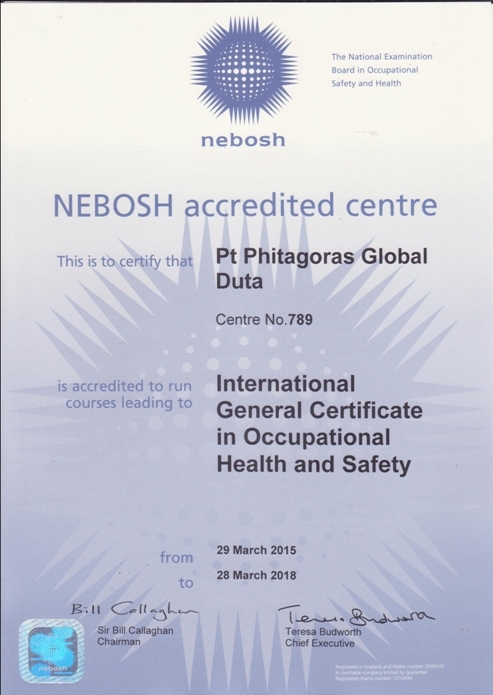 The full time training NEBOSH offered by Phitagoras allows for personnel to be able to dedicate their time to the syllabus and course information and is suited for full time company employees or individuals. Who Should Attend this training NEBOSH ? Training NEBOSH Assessment and Certification Candidates are assessed by a 2 part written examination and a practical health & safety assessment of a work place situation. Each exam is 2 hours in duration. Candidates must achieve a minimum pass standard in all the examinations and assessment to be awarded the NEBOSH International General Certificate in Occupational Safety & Health. 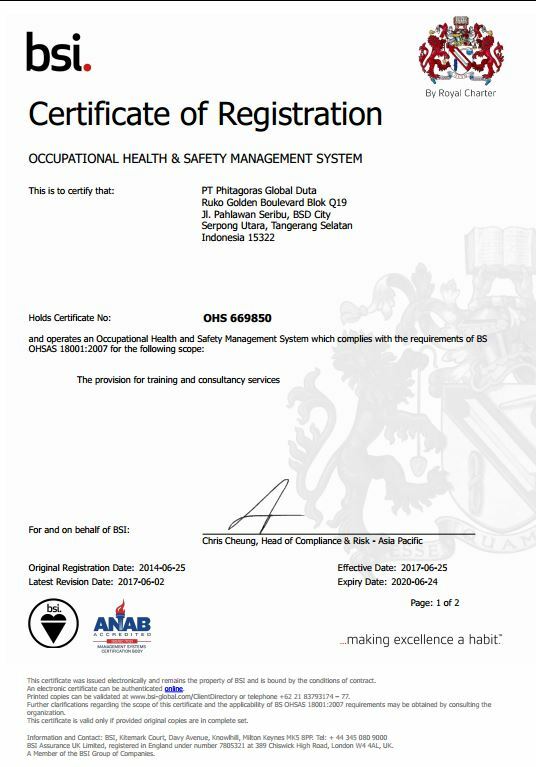 Certification is issued by NEBOSH UK. It is recommended that candidates have a level 2 qualification and/or practical safety experience. The course has two Units IGC 1 and IGC 2 studied over 10 days – Monday to Friday. The two written examinations will be held on the last Saturday. The IGC 3 practical examination will be completed by candidates within 14 days of their examination on their work premises. We would like to express our thanks and gratitude to all participants of Training NEBOSH International General Certificate on Occupational Health & Safety in previous Batch. After I was read your advertised, honestly I am very interesting but I am still at Qatar Now, so I can not register.. I hope you can send me the shedule for nebosh international to my email, because I would like joint with this training for the next shedule. When and where will be the next course (after Aug in Bali course) ? Actually I am interested with NEBOSH certificate in OSH. I was worked in Manufacture company as Production Manager. Now I want to start new carrier in Safety field especially related to fabrication or/and oil and Gas. But I have no experience in this filed yet. Could u suggest me what kind of course that I will need? I would like do Nebosh course what is the fee details of the course. Why training schedule 2010 at Batam be conducted 2 times :February 22 – 27 and March 22 – 27 instead of 1 time like other place? I am interest for this training, but i have same question with email before , why Feb 22-27 and march 22-27 ? 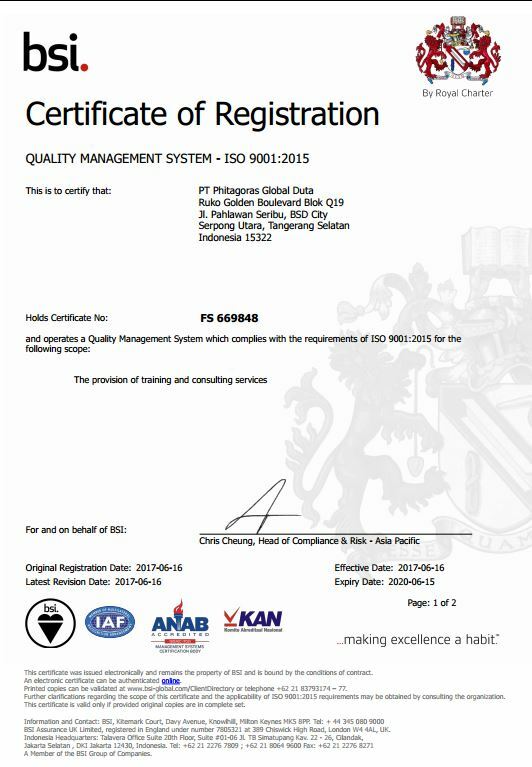 Does this certificate acknowledged and can be used internationally? What about the accommodation, Is it exclude from training charges? if yes can we know rate of room hotel on your recommendation. Since I am interest but I have to spending my own money not from the company. Another question is do you have NEBOSH schedule for 2011. I very interest to joint in NEBOSH IGC. I live eastern Bandung city (Tasikmalaya) and I have family (old brother) stay in Bandung. Could you give me schedule NEBOSH IGC 2011 in Bandung. I will attend to joint in Bandung 2011 because I am INDIVIDUAL PARTICIPANT without SPONSOR from company (Limited budget). I’m interested in this training and plz send me 2011 nebosh training schedule & application form to my mail (especially in bandung). thx. I’m interested in this training and plz send me 2011 Nebosh training schedule & application form to my email. Thanx. Hi why don’t phitagoras conducted Nebosh international diploma from bsc beside Nebosh International General Certificate. I am interested in Nebosh training, do email me the schedule, regulation as well the fee. Send me the schedule, training fee as well the regulation. Do you have an affiliate training center in the Phils. Saya tertarik untuk dapat turut serta dalam training Batch XI. Tetapi sebelumnya, mohon untuk dapat menginformasikan silabus serta biaya training untuk saya ajukan terlebih dahulu ke Perusahaan saya. Saya tertarik sekali dengan training NEBOSH IGC, sangat menunjang sekali untuk ilmu pengetahuan dan karir di dunia perminyakan. Kirimkan schedule dan price list nya dnk? 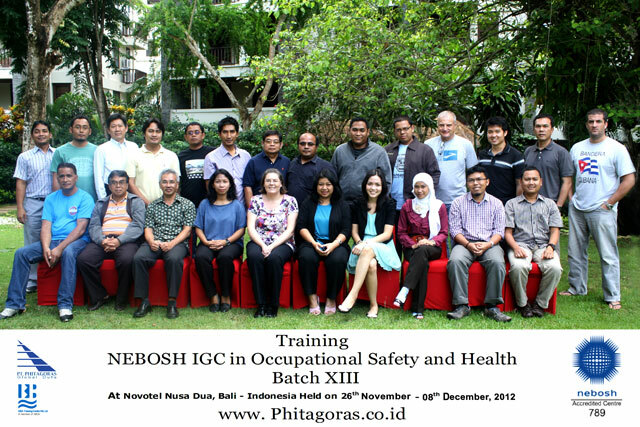 I am very inetrested with Nebosh training, especially on 14 -24 Nov at Bali. I would like to have further informations regarding your next schedule Nebosh training 2012 held in Indonesia. Please send me the schedule Nebosh training 2012 and the tuition fee. Good day and Have a Safe day to all of you there. 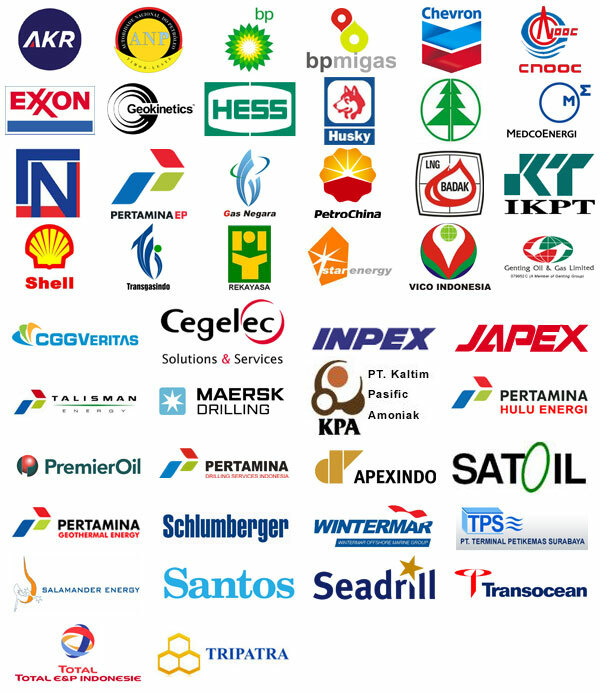 I’m interesting to Nebosh and in the filed of Oil & Gas Industries, Though, If could please sent me further training course schedule in I must prepare in Jakarta Region. Is there have any schedule to running the training at Batam or Jakarta in the next month?, please let me know. saya sangat berminat dalam dunia safety, dapatkah memberi pencerahan tentang minat saya ini ? Untuk training NEBOSH pake english languange atau bahasa indonesia? 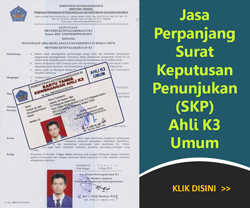 kalo yang belum lancar english bisa ikut tidak?